The Ovation provides the largest range of movement of any articulating keyboard arm on the market today (other than sit-stand arms) in a low profile, durable design. It uses a near-effortless patented "Lift-N-Lock" counterbalance mechanism to adjust an attached tray from 7" below to a full 3.75" above (17" track version: 5.8" below and 2.6" above) the mounting point. A Height Indicator Gauge makes adjustment easy to measure. The inclination, or "tilt," of the tray can be adjusted from a negative inclination of -15° to +10° using a large Dial-a-Tilt knob that includes an "Inclination Gauge" (allowing the user to reposition at the desired angle). 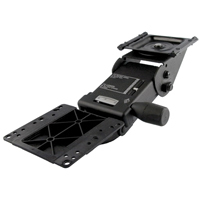 The sleek, low profile design provides excellent clearance for the legs and knees. 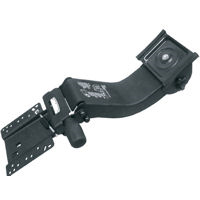 The arm swivels 360° for side to side movement and a 17" (8634D17) or 23" (8624D23) storage track which allows the user to store the arm and tray out of the way when not in use. To fully store an Extra-Deep or Mouse Intensive Tray underneath the desk, an Extended Track (8624D28) version is also available with all the features of the 8624D23 but equipped with a 28" track. All Ovation models accept all standard trays and use a high quality steel ball-bearing storage track that has a much longer lifespan than a glide track. Le bras Ovation offre une gamme de mouvement la plus grande de n`importe bras articulé disponible dans le marché aujourd`hui (autre que les bras d`asis-debout) avec un conception de profile bas. Il utilise un mécanisme contrebalancer, un breveté "Lift-N-Lock" presque sans effort pour ajuster une tablette attaché de 7 po en dessous jusqu`à 4 po au-dessus (la version du 17 po glissière/track: 6.25 po dessous et 2.15 po au-dessus) le point de montage, et inclus un indicateur d`hauteur. L`inclinaison ou pente peut être ajuster d`une inclinaison négative de -15° jusqu`à +10° en utilisant un grand bouton 'Dial-a-Tilt' qui inclus un indicateur d`inclinaison/pente (qui permet de facilement reprendre l`angle désirable). La conception élégante de profil bas offre l`espace parfaite pour ne pas frappé les jambes et genoux. Le bras pivot 360° pour mouvement de côté à côté et à une glissière/track de 17po (8634D17) ou 23po (8624D23) qui peut être ranger lorsqu`il n`est pas utilisé. Pour ranger au complet une tablette Extra Deep, ou tablette Mouse Intensive dessous le bureau, une glissière plus profond (8624D28) est aussi disponible avec une glissière/track de 28 po. Tous modèles Ovation sont compatible avec les tablettes standards. Ils utilisent une glissière de haute qualité à billes qui peut être ranger et à une vie plus longue que les glissières en plastiques. The Ovation Sit-Stand Keyboard Arm by KV Waterloo offers a range of height adjustments to accommodate sit-stand workstations. 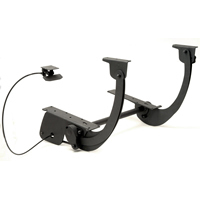 Using a patented "Lift N Lock" counterbalance mechanism the arm allows an attached keyboard tray to be positioned at heights ranging from 8.4" above the mounting point to 5.6" below it. The 23" storage track enables most keyboard trays to be fully stored beneath the desk when not in use. The curved neck (see the first image on the Detailed Specifications page for an illustration) allows users to be comfortably close to the desk when seated and when standing. All Ovation Keyboard Arms include a low profile mounting plate for the keyboard tray. The mounting plate is connected to a "Direct Drive" dial tilt mechanism that includes an inclination gauge. By simply turning the dial, and watching the inclination gauge, users can easily set up their workspace to position their keyboard at the preferred inclination, from a positive inclination of +10° to a flat 0° to a negative inclination of -15°. NOTE: On a standard 28.5" high desk (measured from the underside of the desk), the Ovation Sit-Stand Keyboard Arm will provide enough height for proper "standing" positioning of the keyboard tray with no inclination for users under 5'5". For users between 5’5” and 5’7”, this product can still be suitable but will require a negative inclination on the tray (which brings up the tray worksurface accordingly). This arm is also suitable for individuals under 5’ 7” who are using a “lean-into” seat which puts them in a position between sitting and standing. If negative inclination on the tray is acceptable, users between 5’ 7” and 5’ 10” may also be able to use this product to meet their needs. Taller users may be accommodated by raising the mounting height through use of products such as the Raise-Its. Of course, monitor elevation must also be considered when moving to a standing position. The Volante Desktop Sit-Stand Workstation from KV Waterloo can be placed on virtually any fixed-height desk to provide users with an instant sit-stand solution. It will fit any desk with a depth equal to or greater than the 23.2" footprint depth. This well-engineered product provides a full 13.8" of height adjustment range. Keyboard height will adjust from roughly 1" to 14.8" above the surface and the upper worksurface from 6.2" to 20". Users simultaneously activate the left and right paddle releases to adjust the height to any point throughout the entire lifting range. Gas cylinders provide lift assistance to minimize the effort required to make adjustments and the unique locking system offers infinite adjustment throughout the entire range. Regardless of the height, the Volante provides a highly stable worksurface and keyboard tray, with no detectable wobbling or movement of the mechanism. The cantilever design of the Volante means that as it rises it also moves out and towards the user, requiring them to step back and away to accommodate the new positioning. The upper platform for monitor, tablets, or documents is 35.4" wide by 15.7" deep; while the keyboard and mouse tray is 26.4" wide by 13" deep. The keyboard tray features a tilting mechanism (±10°) so users can adjust the keyboard inclination to provide for optimal neutral alignment of their wrists. The 2" grommet hole at the back of the upper platform can serve as a cable guide as well as for attaching a monitor arm should greater elevation be required. The Altissimo Sit-Stand Workstation from KV Waterloo is an all-in-one solution for converting a sitting desk into a sit-to-stand desk. Mounted at the back, side or corner of the desk, this space-saving workstation effortlessly moves up or down using a gas spring mechanism and is easily stored when not in use. 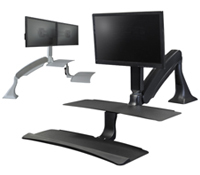 The Single Workstation (6011 Series) accommodates monitors from 5 to 20 lbs, while the Dual Workstation (6021 Series) handles monitors up to 8 lbs each and 24” wide (diagonally). The height range of the Altissimo is an impressive 22” with the keyboard tray ranging from 5” below desk height to 17” above the desk. The monitor has an additional 9.5” of independent adjustment and can be tilted to 45° or rotated 90° from landscape to portrait orientation. In addition, the monitor tower can rotate independently of the worksurface 180° from left to right. The keyboard tray is angle adjustable with 14° of negative incline and 4° of positive incline, while also being height adjustable relative to the upper platform. All these adjustable ranges make the Altissimo one of the most versatile sit-stand solutions available. Note: Those who have already purchased the Single Workstation can upgrade to the Dual model by ordering the Dual Mounting Kit (6021AS60/6021E60). Available colours are Silver (with Gray Accents), Black (with Black Accents), and White (with Gray Accents) (Special Order only). 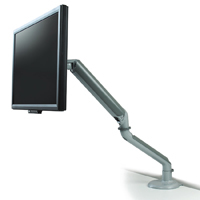 The Duet Sit-Stand Arm can be employed to create a sit-stand workstation suitable for a wide range of users. It offers a wide range of height adjustment, able to be lowered a full 6.5" below and raised to 12.5" above the mounting point. The Duet Sit-Stand Arm features a convenient tilt control release permitting ±15° of worksurface adjustment and a field adjustable coil spring which adjusts for load counter balance. Height adjustment is easily accomplished by using the T-pull release to disengage the lock, then raising or lowering the tray to the desired working height. The slim (only 0.75" wide) dual arm (with crossbar) design ensures that the knees and legs have plenty of room - and far more than any single central support arm. The Duet Sit-Stand Arm is available in four widths, each offering progressively more width between the tray support arms. For optimum workspace and knee clearance the wider models are generally recommended unless there are space restrictions. The Duet Sit-Stand Arm easily accommodates custom-built trays or you may choose to select the appropriate Duet Arm Custom Tray to create a complete sit-stand workstation. The 39" tray is wide enough for a keyboard, mouse, phone and notepad - a complete desk available for use while sitting or standing. When installed on an average height, 1" thick worksurface (28.5" from the floor to the underside of the desk), this arm can elevate an attached tray to 41". By taking advantage of the negative inclination option and angling the front edge of the tray upwards the potential user height range can be extended slightly higher (42" - 43"). Note: For taller users it may be possible to achieve greater elevation by employing a product such as RaiseIts to raise the desk, thereby raising the mounting point. If this is not practical there are many other options available to create sit-stand workstations for taller users. While the Duet Sit-Stand Arm does offer a wide range of height adjustment, it accomplishes this with the sacrifice of storability. If the ability to store the tray below the desk is necessary there are other options which may be suitable. Please call and speak with a Customer Service Representative should this be the case. The Allegretto Height Adjustable Table Base from KV Waterloo is an extra-smooth and quiet electric adjustable width table base capable of supporting table tops from 48" to 90" in width and 24" to 30" (or deeper) in depth. It is available in 2- or 3-leg configurations. Easy to assemble in less than 30 minutes, the Allegretto has an adjustable height range from 23.9" to 49.5" with an adjustment speed of 1.6 inches per second. In addition, a six-button programmable switch with 4 presets allows the user to save height settings according to individual needs. 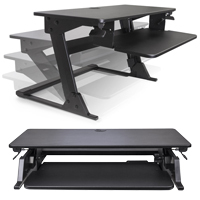 The base can also lift weights up to 264 lbs and has built-in Anti-Collision protection in the event that the table collides with a fixed object while moving up or down, in which case it will stop and reverse direction. The stylish design adds a modern clean look to any office environment, largely due to the absence of a lower crossbar. This base is also UL, CSA and CE certified with a 5 year mechanical and 2 year electrical warranty. NOTE:DIADEM, Conset or iMovR Table Tops can all be used with this base, or you may provide your own custom-made or pre-existing table top. The Tenor Trackless Keyboard Arm from KV Waterloo was designed to require the minimal amount of undersurface mounting space while still providing storage for keyboard trays up to 9.5" in depth. Requiring just 9.375" of mounting depth, the Tenor Trackless Keyboard Arm features a direct mount which is ideal for situations where there simply is insufficient space to accommodate a traditional track-mount keyboard arm. It will permit full storage of trays up to approximately 9" deep. While 11" deep trays can also be mounted only about the first 9" of depth will be stored (i.e. on an 11" deep about 2" of tray will protrude). The Tenor Keyboard Arm has all the features of traditional "tracked" arms. Keyboard height and storage are easily accomplished employing a simple "Lift-N-Lock" mechanism and angle adjustment (+10° to -15°) is a simple Dial-A-Tilt. Clearly readable independent gauges behind the tray show the current elevation and angle. Elevation ranges from -1.25" to - 7" below the mounting surface, a full 5.75" of range. The Low Profile head ensures optimal knee and leg clearance at all positions—even when fully stored the arm extends only 5.75" below the mounting point. The arm also features a full 360° swivel mount, offering the potential for full storage of deeper trays by rotating the tray below the desk surface when sufficient clearance exists. 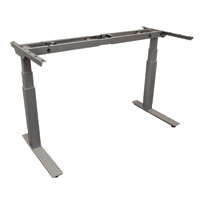 Sit-Stand desk users who desire a keyboard arm may find that the direct mount and compact design of the Tenor Trackless Keyboard Arm result in less vibration transfer to their monitors than do traditional tracked arms. 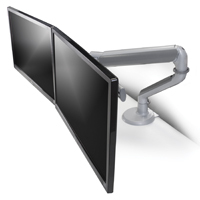 As well, the trackless "direct mount" design lends itself to installation on desks with crossbars which would normally render the installation of a tracked keyboard arm impossible. However, if there is sufficient space to accept a 15.25" deep track the Staccato Keyboard Arm may be a better alternative. It will accommodate similar tray depths with the same restrictions - ie. 9" deep trays will store, 11" deep trays will protrude by about 2". The advantage it has over the Tenor Trackless Arm is that it has a more traditional height adjustment mechanism where the tray moves only slightly closer to the desk as it is lowered. NOTE: The Tenor Trackless Keyboard arm DOES NOT accommodate the hole pattern of Humanscale Keyboard Trays. The HDPE Mini Keyboard Tray from KV Waterloo is ideal for situations where storage space for keyboard and mouse is highly restricted. With a width of just 19.4" and depth of 9.4", the tray is capable of accommodating virtually any keyboard. The rigid 0.5" thick tray is formed from HDPE (High Density Polyethylene) which is fully recyclable and features non-slip strips for secure keyboard placement. The included pivoting mousing surface is formed from 0.25" thick phenolic resin and includes a repositionable mouse guard and cable manager. The 9" diameter mousing surface is positioned 1.34" below the keyboard surface can be mounted to the right or left and pivots below the tray for storage. 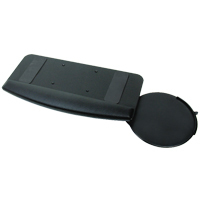 Included with the Mini Keyboard Tray is a removable gel-feel foam palm rest. 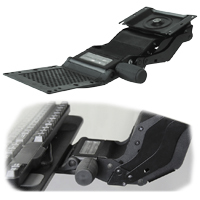 The Mini Keyboard Tray features a universal mounting pattern for easy attachment to any KV Waterloo keyboard arm. The compact dimensions of the HDPE Mini Keyboard Tray make it a perfect companion for the Tenor Trackless Keyboard Arm which was designed for the same highly restrictive space limitations. This combination of products offers the ultimate in compact keyboard storage.